Jeff (Jake Johnson), a magazine writer in Seattle, sees the ad and convinces his boss (Mary Lynn Rajskub) to let him do a story about whoever placed it. Jeff takes along two interns, Darius (Aubrey Plaza) and Arnau (Karan Soni), as they track down the wannabe-time-traveler, Kenneth (Mark Duplass). Jeff can’t gain Kenneth’s confidence, but Darius does, and convinces him she wants to go along for the next ride back in time. As their relationship grows, we learn everyone’s motives revolve around lost love. To tell you more would be to spoil a quirky little indie that works because it’s played small. There are no grand special effects or stunt-filled car chases. 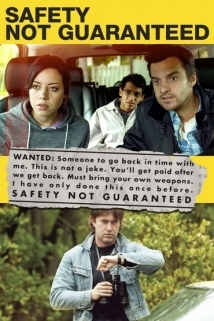 “Safety Not Guaranteed” is a character study with a couple of twists and some wonderful chemistry, particularly between Plaza and Duplass. That’s why I have added it to my Movies You Might Not Know list.